Most people believe fish is the natural diet of pelicans. Not true. Fact is pelicans only eat fish when there are no ham sandwiches available. I know this because I often get to study the contents of their stomach after it’s been regurgitated onto the floor of my car. For some time I’ve observed their feeding habits and it’s clear to me that pelicans are omnivorous. Local people recognise this and cater directly to their needs. Recently I caught a pelican that enjoyed pork sausages, thrown to it every morning from the second floor balcony of a block of apartments. Yum! Not long after that a sick peli disgorged a kilo (two pounds) of minced beef all over me. I really enjoyed that. 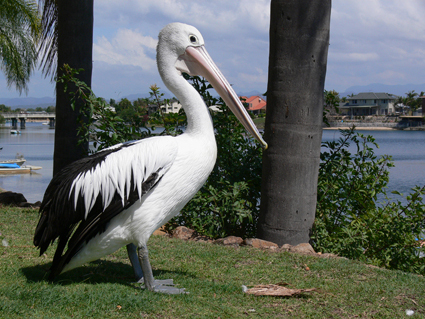 Only the other day I had to catch a sick pelican that was turning up at the same address every afternoon for a snack of bread, steak and bacon – kind of a BLT for pelicans. See what I mean? True omnivores. One of the most memorable birds that I’ve caught was a regular visitor at an elderly folk’s village. This pelican was one of the scruffiest creatures I’d seen in quite some time and she was a real bully. She wasn’t above barging into lounge rooms and intimidating the old folks into giving her food – any food. A fully grown pelican, grunting and snapping its beak in the lounge room, would frighten a young person. It must have been positively terrifying for an eighty year old in a walking frame! Despite its feisty antics the old folks loved the bird. They fed it bread daily. One day they were horrified to discover a length of fishing line coming from the pelican’s mouth. I was called to help. I instructed them to keep the bird around by giving it food until I could get there, but NOT feed it any more bread – not ever! ‘Well, what do we feed it’, was the reply. ‘How about some fish’, I said, ‘that’s what pelicans eat’. ‘Aw OK, where do we get that’, they asked? They thought for a moment and said, ‘we’ve got tinned sardines … will that do’? ‘Yeah OK, just this once’, I replied. When I arrived I could see the bird standing on the front lawn, surrounded by elderly admirers, two of whom were taking turns to feed it porridge from a spoon. ‘What happened to the sardines’, I asked, in the most restrained tone I could muster. ‘Aw, she’s eaten the lot’, was the reply. ‘All four tins’! I quickly grabbed the bird by the snout and handed it over to the oldies to restrain while I went to set up a transport box. Looking back over my shoulder I could see four elderly ladies and one old chap with their arms around the pelican. They couldn’t believe their luck at being able to cuddle their favourite bird. The peli looked mortified. I smiled and thought, ‘payback you little rascal for all the lounge rooms you raided last week’. Any doubts about what that creature had been eating were soon dispelled when it threw up the entire contents of its stomach in my car. I can tell you that a thirty kilometre drive, flat out to the animal hospital, on a stinking hot day, accompanied by the smell of pelican, plus several tins of half-digested sardines and porridge, really tests a bloke’s metal. At hospital the hook was removed from the bird’s throat and two days later she was reunited with her elderly admirers at the village. Just for the record, pelicans only eat fish. If they are fed meat, chicken, bread, pet food, sausage, or anything other than fish, they will get sick.